AMA National, FAA Info., NH Bill Info. AMA - FAA Regulations, Info. Invitation from Andy to join AMA District 1 at no charge! New free downloads available at the District 1 website: "AMA Safety Handbook,” “AMA 2017 Legislative Report," and a useful “AMA Government Relations Advocacy Toolkit." I am writing to let you know that our district team of AVP officers and I will be at AMA EXPO East and we welcome you to stop at the AMA booth to say hello and ask any question you might have. Click on the following link to go to the AMA EXPO EAST event website for event information and a list of vendors with more being added daily. Please check out and join the district 1 website (It's Free) at www.amadistrict-i.org We recently posted on the HOME page a new "AMA Safety Handbook," an "AMA 2017 Legislative Report," and a useful "AMA Government Relations Advocacy Toolkit" for clubs and members that can be downloaded. I am also asking for your help in responding to a request from district I member Lloyd Burnham, who represents us on the AMA SIG National Miniature Pylon Racing Association's contest board. 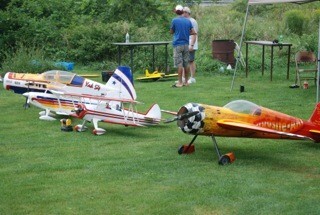 Lloyd and six other district members compete nationally in the 426 and 422 pylon race class. Unfortunately, they are no longer able to practice for competitions as they have in the past at Westover AFB. They are looking for a club that would allow then, at the clubs conveyance, to utilize the club's flying site to practice their pylon racing for only 4 or 5 times a year and on weekdays so as not to inconvenience club members. Their pylon group of six members is willing to join any club for this very limited use of the club's flying site. Without the use of a flying site for this group to practice, district 1 would likely not be represented in national pylon racing competitions. These classes of race type aircraft and flying do require a flying site that is unobstructed/open, away from houses and with a fabric or asphalt runway size of about 30 ft. wide and 300 ft. in length. If your club's flying site can support this group of limited use members, please let me or Lloyd know. Call Lloyd at 860-997-0216 or email me. As always, if your club or members need any questions or help in applying for AMA programs, services or benefits, let me know. Thank you, and hope to see many of you at AMA EXPO EAST!